So, after leaving our first game and having a quick trip round the Christmas market, it was time for the main event: Bewilder Box. I’d first met the team behind this venture about six months before, when we’d been involved in a TV segment on escape rooms and I’d had the chance to spend a couple of hours chatting with them about the industry in general and their plans for Bewilder Box in particular. I’d been impressed enough to back their Kickstarter project (in spite of them being down in Brighton!) so was really looking forward to finally trying out their experience. Would they live up to my expectations? We headed down to the Hobgoblin, the pub where the game is located, and waited in the bar to be brought upstairs. I’ve said it before but I’ll say it again: I like games in pubs. There’s something relaxing about being able to turn up at your final destination in advance rather than trying to time it to arrive in a five-minute window just when required. If the game’s running ahead of schedule they can get you early, and if they’re late then at least you don’t end up hanging around having rushed your drink elsewhere. When our time arrived, we were greeted by a slightly eccentric quantum scientist who took us upstairs. One of the nice touches about this game is that the two owners play the hosting role as an entirely different persona – one as the posh quantum scientist we’d been greeted by and the other as a cockney quantum engineer. Both played their parts well so, even if you end up with just a single host, you’ll still get a great experience. Unusually, the theatre starts well before you enter the game itself – using a scanner to enter the briefing area and then getting the briefing in character followed, of course, by a video briefing from the star of the Kickstarter campaign, Hugo Myatt. Whether you’re a fan of Knightmare Live or the original TV series, you’re in for a treat because the video introduction contains both original and modern Treguards playing the two generations of Bewilder scientists. We’ d not even entered the escape game and already I was impressed. A long time ago (the 80’s) in a town not too far away (Brighton), the Bewilder Box initiative was born. It was the brain child of Dr Benjamin Wilder Sr, a brilliant and compassionate man whose ultimate goal was to create a disaster recovery plan for the human race. What would happen if we faced a global catastrophe such as a meteor strike or an alien invasion? How would we recover and who would lead mankind to salvation? To find the answers to these questions, Dr Wilder and his team devised the Bewilder Box assessment; the ultimate test of brain power, cooperation, leadership, logic and strategy, in hope of finding the best of the best. These candidates, if successful, would become pioneers, leading the human race into the new world. The work of the initiative was deemed a great success, until suddenly, mere weeks into the initial subject screenings, Dr Wilder mysteriously vanished along with his research. Without the leadership of the Doctor the initiative floundered and disbanded. Dr Benjamin Wilder Jr, one of the brightest minds of his generation, has spent the last 20 years following in his father’s footsteps. Painstakingly piecing together fragments of research and resurrecting the initiative, he is driven by a desire to honour his family name and complete what was started over 30 years ago. 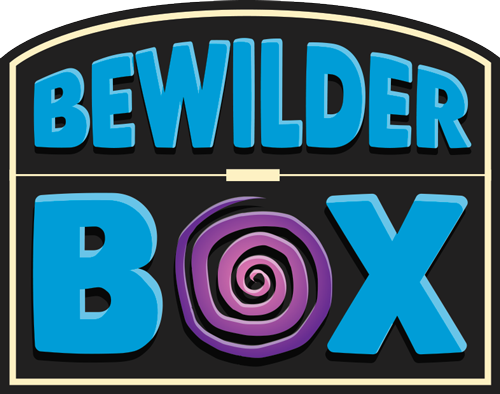 The Bewilder Box Initiative once again opens for business. As you walk into the room, it’s clear they’ve made an effort with the decor. Although this is not an escape room that’s been put together on a huge budget (not that many are), a lot of effort and love have clearly been poured into it. In addition, they’ve used creativity to achieve an impressive effect (who’d have thought you could use a dish-drying rack to make a room look futuristic!). Granted, if you look closely, you’ll see a few rough edges but, if you’re just playing the game, it’s rarely noticeable and often quite charming. The lighting level also helped to hide some of the minor flaws and, while we occasionally needed a torch for the darker corners of the game, it was never a problem. One of the first things you’ll notice on entering the room is the clue system. D.A.V.E. (also the name of the two owners – not sure if that makes them egotistical or self-deprecating) is your artificial intelligence guide to the world and adds to the experience in lots of subtle ways. It’s rare to find a game which manages to blend the clue system into the theme, but they managed it beautifully here with D.A.V.E. available to guide you through the game if you needed it. He’s also on hand even if you’re not in need of help, engaging you in conversation and commenting on what you’re up to. I highly recommend making it clear early on if you’re the sort of team that likes to joke around. The only negative was that his voice was a little fuzzy at times (or my hearing is failing me…) but, generally, if he repeated a clue or comment it was understandable enough. Having said hello to D.A.V.E., the next thing I did was start playing with something that didn’t seem quite right. Was I really meant to be doing what I was doing? A few seconds later, one of the hosts (the quantum engineer) came into the room to fix it – apparently they’d made a mistake when setting up the game for us. You might think that would be disappointing, but the relevant thing here is how they handled it. Every escape room will have the occasional issue with re-setting the game, and the true test is how they handle it. Firstly, they spotted it quickly – they were paying attention to what I was doing and realised that something wasn’t quite right. Secondly, they fixed it quickly and, impressively, in character. Giving clues and fixing a mis-set while not breaking the immersion one iota? I can count on the fingers of one hand the games where I think they’d manage that. Bravo! So far, so good. But what about the puzzles? This room was right up there with some of the best games I’ve played. There were some common puzzles but they’d generally dressed them up in interesting ways. There were plenty of puzzles with physical interactions. There were puzzles that worked seemingly by magic. There were some which seemed easy but were deliberately misleading. There were puzzles where you slowly built up pieces or found tools and wondered how you would use them. Most importantly of all, the puzzles were both logical and plentiful. The nature of the story (you’re taking an intelligence test) means that any puzzle is legitimate in the context of the room but, if I’m being picky, there was one particularly chunky part that I felt was slightly out of place with the rest of the game. It wasn’t massively so but, for example, it required a small amount of outside knowledge and had significantly more process than other parts of the experience. While the game is in essence a series of puzzles presented as tests, there’s still room for an interesting storyline that even managed to develop a little during the game. That story, together with the game itself, comes to a nice crescendo, and the puzzles likewise converge in an enjoyable final section that leaves you with a warm, fuzzy feeling that the game ends in just the right place. We escaped after about 35 minutes with one small clue. We really shouldn’t have needed the clue either – this game was entirely logical from start to finish. I thoroughly enjoyed this room and, the more I think about it, the more impressed I am. The introduction is excellent, the games masters are fun, the puzzles are logical, enjoyable, and plentiful, the theming is attractive, charming and pervasive, the story is engaging and the game flowed from start to finish. This is a game well worth travelling for. Londoners: jump on the train and get down to Brighton. Locals: be grateful to have an amazing game on your doorstep. If you have a chance, head along and play: whether you’re an enthusiast or a first-timer, you’ll have a ball. The pub has award-winning burgers but we decided to wander round Brighton instead and ended up at Casa Lingo, on the other side of town. It may be a little pricey but it’s a great quality Italian restaurant. The garlic bread was good and everyone seemed to love their main courses. If you ever make it to London, it’s really not much of a trip – an hour by train to get down there. Frankly, I travel for an hour to get to almost *any* escape room. The joys of London!